Help us add some color to the MetroBus fleet by painting a bus on Saturday, October 20 from 11 a.m. to 1 p.m. at the Pagedale Town Center, located at 6763 Page Avenue. The event is free and open to all ages. When completed, the Art in Motion bus will go into regular service and travel along a variety of MetroBus routes in St. Louis City and St. Louis County for one year. The Arts in Transit Bus Painting is co-sponsored by Beyond Housing and the Normandy Schools Collaborative. Both organizations belong to the 24:1 Community, a name that represents the 24 municipalities in the Normandy Schools Collaborative with one vision for successful children, engaged families and strong communities. Additional event sponsors include Life Arts Inc., the Missouri Arts Council and the Regional Arts Commission. 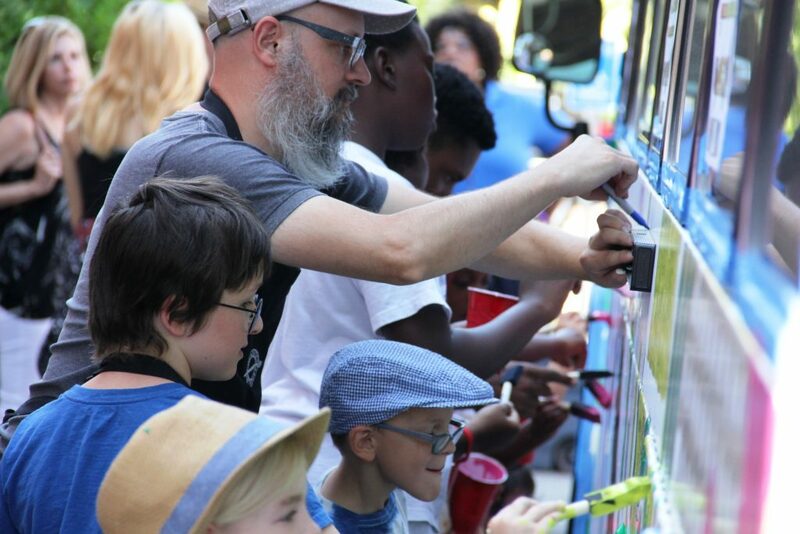 The design for the Art in Motion bus was created by local artist William Burton Jr., and includes images of community members, buildings, trees and text, highlighting a vibrant, colorful neighborhood.